We aim to provide a high-quality computing education designed to equip pupils to develop and use computational thinking and creativity to be able to understand and change the world. · Progress children’s ability to use information technology in a range of ways in order to express themselves and develop their ideas (digital literacy). The latest resources to allow them to experience, use and master a wide variety of programmes. Computer science (coding) – understanding and applying the fundamental principles and concepts of computer science, including abstraction, logic, algorithms and data representation, in order to think analytically to solve problems. Digital literacy – creatively using information and communication technologies to represent their ideas and present their work. We believe that the internet is an essential part of children's learning, offering a huge range of useful educational material and information across the curriculum. Our 'Acceptable Use of the Internet' policy, explains in more detail how we use ICT and the rules that are in place to keep everyone safe. 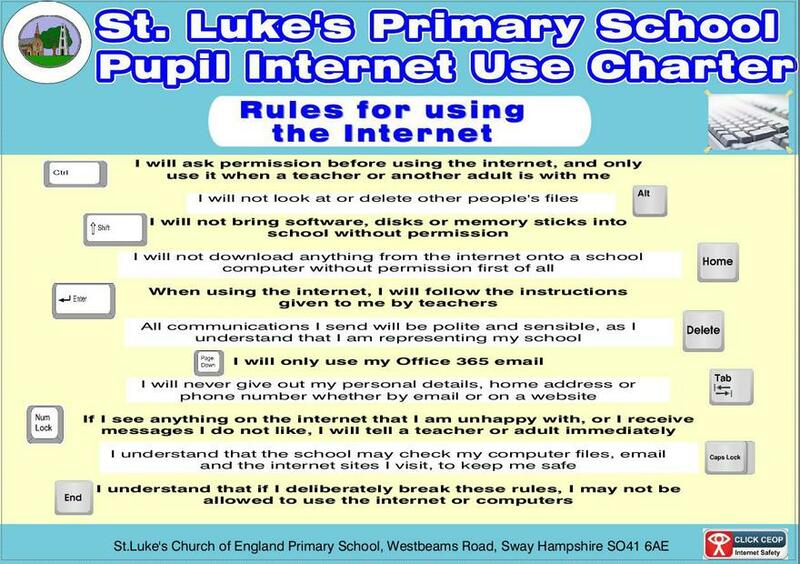 All children are asked to sign the 'Pupil Internet Use Charter' as part of the ICT curriculum. In this way, we hope that everyone is clear about safe use of the Internet and abides by these agreements. All classrooms have an interactive whiteboard and visualiser which is used to deliver lessons across the curriculum. Each classroom has a digital camera and mini ipad which children and teachers use to record their work, collect evidence and document activities. The ICT suite contains enough computers for a class to work individually. 32 tablets can be used by teachers for lessons across the curriculum. The school has additional hardware equipment such as webcams, Lego Mindstorm and roamers which can be used. The school has a set of ‘Know It All’ DVDs, for use when teaching e-safety. Every classroom has a copy of this. The school has also begun to make use of Office 365 email as a way of enabling pupils to communicate throughout the school. The school also makes use of a range of subscriptions for supporting teaching and learning. In particular scratch is used for many of our programming units and Microsoft Office programs (such as Word or PowerPoint) to deliver many of our digital literacy units. We also use animation software for stop-motion movies and 2investigate software for branching databases. In groups of 4, Year 3 pupils made a short movie to communicate the importance of our Golden Rules or Learning Heroes, using ipads.